Your home is the most important asset in your life and keeping your home and family safe is undoubtedly your utmost security. There are a lot of things that can be done in order to enhance the overall security aspects of your home, but the most basic and effective is to have strong and robust private deadbolts and other locking systems installed at your property. The better the type of lock mechanism at your home, the improved are chances of thwarting any danger of any break-in or theft. There are several types of locks but the most secure, according to locksmiths, security experts and backed by stats is a deadbolt lock. So, what is it that makes a deadbolt lock so effective and stronger option? Let’s discuss this. Distinctive from a spring lock, a deadbolt lock has a steel bolt outspreading into the door jamb and frame strike plate. To open the deadbolt, a key has to be rotated to move the lock to the open position. Single Cylinder – The most common type that has a keyhole on the outside and a twist knob on the inside. It is operated by a key on one side and therefore must be installed on doors that don’t have any nearby breakable glass. Double Cylinder – Both sides of the lock have keyholes, thus it is operated by using a key on both sides which makes this safe even when there is breakable glass near the door. Keyless – This type of system has the lock mounted inside with a keypad on the outside which can be configured to operate using password or finger sensor. This provides a more secure option as it does away with the requirement of a key. Based on the type of property, a security requirement, and considering who is going to gain access to the property you can consult your Locksmith in Dallas, or wherever you are, to install the right type of deadbolt lock. A spring or standard lock can be opened up by retracting the bolt applying force using knives, crowbars, and such tools. In comparison to this, a deadbolt lock is highly impossible to break through this way. 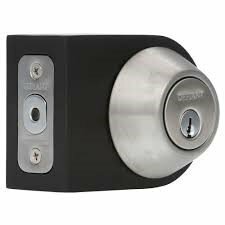 Therefore deadbolt provides much better resistance to forceful entry. Unlocking a deadbolt is extremely tough and could take a lot of time, thereby making the thief or a criminal to think twice about. This makes a door with a deadbolt lock a less desirable target. A deadbolt lock installed along with an initial door lock provides the second line of defense as it is installed on the inside and thus makes it nearly impossible to be picked by intruders. What makes a deadbolt so effective and strong for your property’s security is the way it is installed. A properly installed deadbolt ensures optimal function. You must also consult your Locksmith in Dallas to properly assess what doors at your property needs deadbolt lock security.